30 x 22 1/2 in. One of the twentieth century’s most profound Abstract Expressionists, American artist Sam Francis (1923-1994) is noted as one of the first post-World War II painters to develop an international reputation. 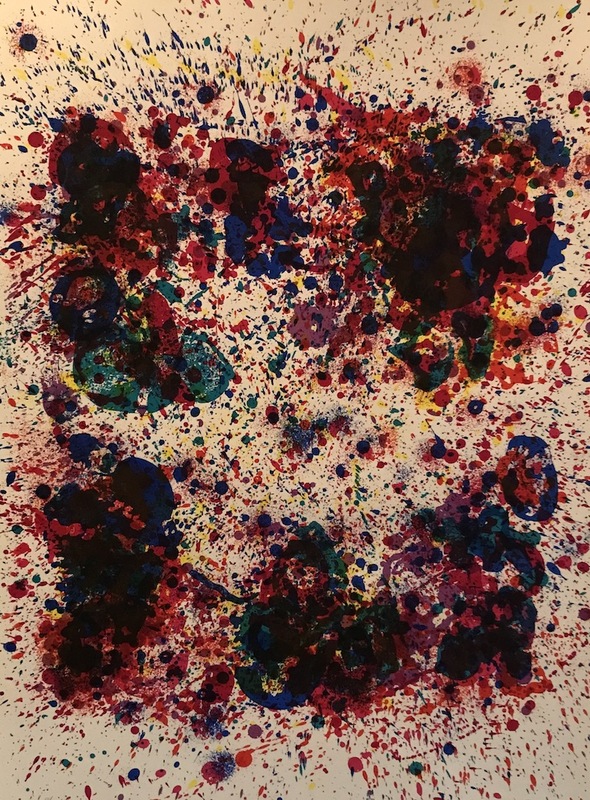 Sam Francis is widely known for his exuberantly colorful, large-scale abstract paintings, that show a unique style of painterly abstraction, even if he created thousands of different artworks as well as works on paper and prints. Regarded as one of the leading interpreters of color and light, his work holds references to New York Abstract Expressionism, Color Field painting, Chinese and Japanese art, French Impressionism and his own Bay Area roots. All these influences are due to the fact that, during his career, he traveled widely in Europe and in the Eastern countries, opening studios and actively getting in contact with local artists and art movements. Francis served in the United States Air Force during World War II, before being injured during test flight maneuvers. He was in the hospital for several years, and it was while there, after being visited by artist David Park, that he began to paint. Once out of the hospital he went to Berkeley to study art. He received both his Bachelor degree and Master degree from University of California, Berkeley, where he studied not only art, but also several different sciences like botany, medicine and psychology. For the next four decades he traveled and studied extensively. In 1950 Francis moved to Paris, where he would go on to be named by Time Magazine as “the hottest American painter in Paris these days”. This was a transformative period of his career, where Francis immersed himself in the study of Monet’s Water Lilies and was deeply influenced by his close friendships with the Matisse family, Joan Mitchell and Helen Frankenthaler. Francis returned to California in 1962 after having spent a long time in Japan. In the meantime, the color blue had become a more dominant feature of his work, inspired by personal suffering and the great joy of becoming a father for the first time in 1961. This led to combinations of hard color and more disciplined structures with centrally placed rectangles during the 1970's. Eventually these more rigid structures gave way to looser configurations. This is the case of this work of the week, Untitled. Blue, sometimes dark, sometimes brilliant, remained an important part of many later works. Sam Francis has always been a very interesting figure, not only for his work as an artist. He has been a contemporary renaissance man. His interest in the creative process was expansive and synergistic – art, technology, psychology, science, medicine, and protecting the environment (before it became a movement). He can be considered a pioneer, being an early investor in research to find creative solutions to our dependence on non-renewable energy sources and cures for AIDs. He was married five times, and was the father of four children. He married his last wife, painter Margaret Smith, in a Shinto ceremony in Japan in 1985. Their son Augustus, born in 1986, is also an artist. For Sam Francis, exploring the creative process was his driving force. It impacted not only his art, but his view of human progress. Francis possessed a lyrical and gestural hand, enabling him to capture and record the brilliance, energy and intensity of color at different moments of time and periods of his intense and eclectic life. His artworks embody his love of literature, music and science, while reflecting his deep range of emotions and personal turmoil.